Why Emgu.CV.Invoke Error when running the code? Could you please tell me why CV.Invoke eroor kept bugging me?I mean i did all the configurations according to the manual on fewtuitorials by Mahvish and everything works fine for other sample codes.The source code builds fine but the emgu.cv.Invoke error is happening when i try to run the code.And the running stops at the point where Haar cascade get initialized.I really want to run this code and see how it works. Looks forward for your response! 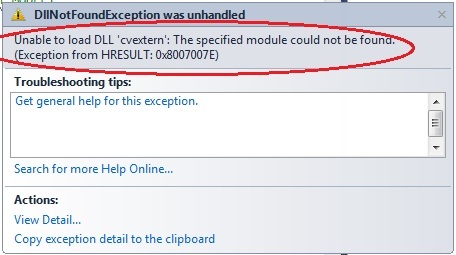 Re: Why Emgu.CV.Invoke Error when running the code? If not run with this project(all is ready for run), check your OS or your EmguCV libraries, because this project has already run in thousands of PCs correctly. hello ,i can not download the code ,can you email it to me ? yel915@sina.com,thinks for all!! if i can correct the bug i will update the code an download links, if isn't my error, i talk with the EmguCV team for solve this. PDTA: Be patient, my life in this moment is very busy. Good Evening!, I am currently working on my final year project (face recognition). First of all very thank you for your Project and sharing with us the informations and replying to others queries. Your project is a great source for my idea and project. when i used your project when no face is added in the database it works as detecting faces(only rectangle no names displayed) in the current frame(video from camera) and when i add some names -faces to the binary database(trained images folder) it works as it should be recognizing added faces but some new face comes in the video frame the application displays the last added name. This the issue i am unable to rectify could you please help me how to resolve this issue. If some new person arrives in video it might display as "INTRUDER" or not displaying anything. Could you please help me ? or anyone who know how to resolve this please post your comment or send private message. i will send mail id or IM id. Thank you very much for your awesome work.. i am currently working on face recognition project. with your project as base idea. When i tried your application it always shows the last added label as name of the face recognised could you please help me to find what had gone wrong while i am trying your project. Can not download source code, linked can not opened? Effection code for face dection, I think this will help me a lot doing my projection. However, i met issues when trying download source code. I click the download link of source code on top of the article, while download page can not opened. I tried many times but still can not open download page. Re: Can not download source code, linked can not opened? could you give me a wrapped up version of source codes. All links are alive and working perfect, try with other browser. Error Message: Invalid length for a Base-64 char array. yes, is an error, but in what line of code?? hi i'm going to develop a website to recognize faces through webcam and save their details. So can i use this imageBoxFrameGrabber (emgu.CV.UI) for a ASP.Net(C#) project? or is there any other way to open client's webcam through the web page and recognize their faces? I am sorry but i don't know. I have a problem with load previous trained faces. I trained a few faces and if I want to start application I have this error: "System.FormatException: Input string was not in a correct format." What's wrong in it? Is this because of this line: NumLabels = Convert.ToInt16(Labels) ? Re: Input string was not in a correct format. Trainedlabels.txt content is wrong inside, please delete this archive a retrain the prototype. a very excellent code ! very simple implementation ! !